Asian stocks edged up on Thursday, while the dollar’s gains were limited as President Donald Trump’s struggle to push through a healthcare reform bill raised doubts over whether he can win support for pro-growth economic policy measures. European markets are poised for a stronger start, with financial spreadbetter CMC Markets expecting Britain’s FTSE 100 to open 0.1 percent higher, Germany’s DAX to be up 0.4 percent and France’s CAC 40 to begin the day 0.2 percent higher. Having weakened as much as 0.4 percent a day earlier, sterling was steady at $1.2489, showing little reaction to the attack close to Britain’s Parliament that left five people dead, including the attacker and a police officer, and 40 injured. Police said they believed the attacker was inspired by Islamist-related terrorism. 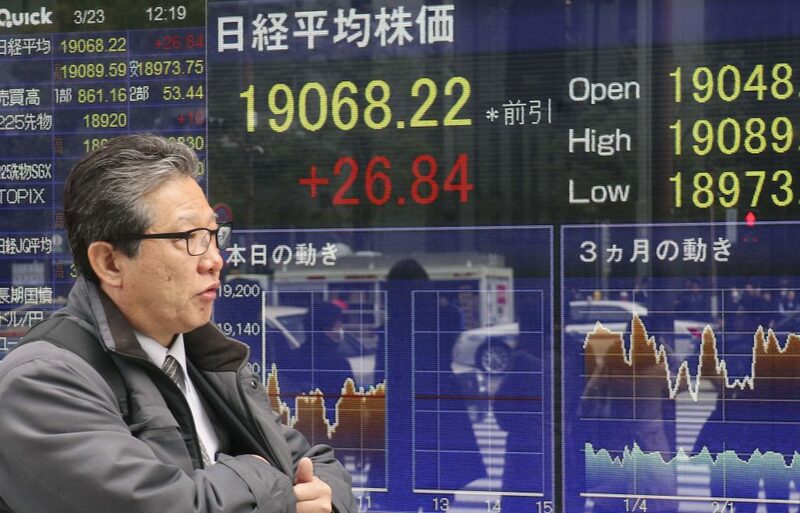 MSCI’s broadest index of Asia-Pacific shares outside Japan advanced 0.2 percent. Japan’s Nikkei closed 0.2 percent higher, as a weaker yen offset a political scandal over the relationship of Prime Minister Shinzo Abe and his wife with a Japanese nationalist education group that bought state-owned land at a fraction of its appraised price to build an elementary school. China’s CSI 300 had made early gains on hopes that index compiler MSCI may include A-shares in its indices, but those gains were lost as money began flowing out of the mainland market through a link to the Hong Kong exchange. The Shanghai Composite dropped 0.3 percent, while the H-share index added 0.2 percent. Hong Kong’s Hang Seng retreated 0.1 percent. Overnight, the Nasdaq jumped 0.5 percent and the S&P 500 closed 0.2 percent higher, while the Dow Jones Industrial Average was flat, after all three touched their lowest levels in about five weeks earlier in the session. The dollar advanced 0.2 percent to 111.37 yen, after dropping to 110.75, its lowest since Nov. 22 overnight. The dollar index, which tracks the greenback against a basket of six trade-weighted peers, added 0.1 percent to 99.76, after touching a seven-week low overnight. President Trump has been trying to rally support for his plan to repeal the 2010 Affordable Care Act, Democratic former President Barack Obama’s signature healthcare legislation. On Wednesday, President Trump and Republican leaders of the House of Representatives said they were making progress in their efforts to win over conservative Republicans who have demanded changes to the legislation. They plan a vote on the bill, President Trump’s first major legislation since he took office, later on Thursday. Investors in Asia are awaiting a rate decision from Taiwan’s central bank, which is expected to remain on hold. Ahead of that announcement, the island unveiled a stimulus package of T$882.4 billion ($28.95 billion) over eight years, subject to legislative approval. The U.S. dollar was little changed at 30.492 Taiwan dollars , and Taiwan stocks closed about 0.1 percent higher. The New Zealand dollar was steady at $0.7046 after the central bank held interest rates at a record low 1.75 percent, and reiterated it would remain there for a “considerable” period of time, citing global volatility and U.S. protectionism. In commodities markets, oil prices rebounded, after touching their lowest level since November overnight on data that showed U.S. inventories, already at a record high, grew by far more than forecast. Analysts said oil had found technical support and was being pushed up as traders took new long positions after the overnight low, but supply concerns kept the gains in check. U.S. crude added 0.75 percent to $48.40 a barrel on Thursday. Global benchmark Brent climbed 0.7 percent to $50.99. The dollar’s recovery weighed on gold, which retreated 0.25 percent to $1,245.60 after hitting a three-week high overnight.